Snail slime isn’t usually associated with anything pleasurable, so why would anyone apply it on the face? One Ingredient is a brand, which come up with the answer to this question. Intense Renewal Cream Snail Your Skin is a luxurious simplicity, a confirmed effectiveness and an innovation in the conditioning of sensitive skin of face. How does Snail Your Skin from One Ingredient work? It is the only cream, which in its composition has 95% of active ingredients, from which 80% is the highest quality snail slime. Intense Renewal Cream from One Ingredient with Snail Slime has Ecocert certificate, which means, that it doesn’t consists of any preservatives, colourants and harmful substances. Concentrated formula of Snail Your Skin in a complex way reduces skin imperfections, smoothers and creates perfect make-up base, while being delicate and long lasting. What are the properties of Snail Slime? In the One Ingredient laboratories was discovered, that snail slime extracted in an non-invasive way from organic breeding, is a natural source of collagen, elastin, hyaluronic acid, glycolic acid, vitamins A, C and E and micro-elements. 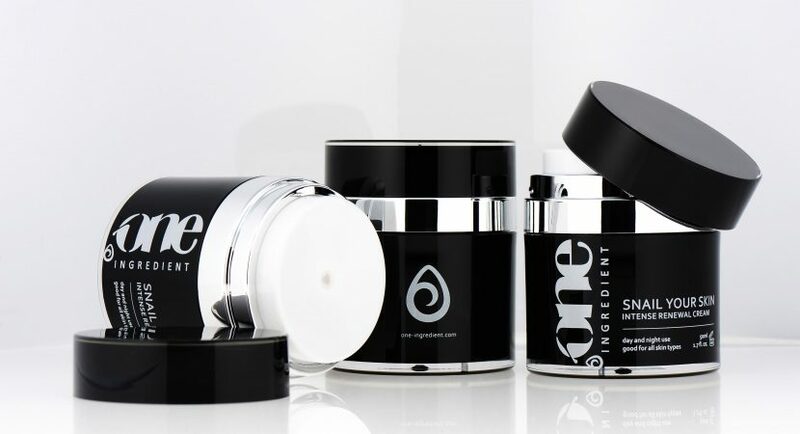 Diversity of active ingredients is a simple way for bio-stimulation of skin. Price of Snail Your Skin is really high (for 50ml/1.7 Oz. we will pay about 45 £), but properties of this cream can convince anyone to this investment. How does Snail Your Skin work? provided protection complex against harmful external factors.